I love me some alcohol inks! You really can’t mess them up because no matter what colours you pick to blend together, they all work – no muddiness or anything, they just play nice together! And if you don’t like what you get then add more or, on certain surfaces, wipe it all off and start over! I mean really, what’s not to like about that? There are a bunch of techniques I love – using them on canvas, making plaid, removing parts with Archival Ink – but one of my favourite looks is marbled. This looks the coolest on fragments (you can also get charms), but works equally well on any transparent surface, like acetate or page protectors. For me, it’s just an embellishment as is, I don’t do anything more than make them and adhere them to my project, but you could also stamp sentiments and images over them to use as focal points. Alcohol Ink, Fragments, Ink blending tool with felt, heat tool (optional). 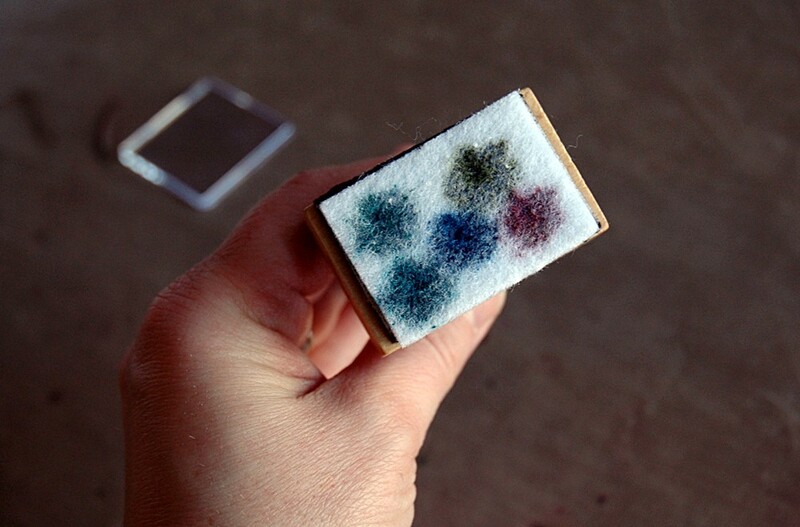 Now, pounce your felt all over your fragment, twisting the ink blending tool as you go to mix and blend the colours. Don’t worry about what this layer looks like, we’ll be adding lots to it yet! Because I’m impatient, I use a heat tool to speed up the drying process though it really isn’t necessary as they dry pretty quickly. Next, add a little more intense colour to the felt, if you wish. I thought the first layer was pretty light and needed some depth so I added a darker colour. Then you pounce and dry again. I don’t add any more ink after this step since you want the felt to dry a little – as it dries and you add more layers, it gets “stickier” and builds the effect we’re going for. Just keep pouncing and drying, pouncing and drying, until you get dark lines running through the colours on the fragment. I like the fragments because of the thickness and translucency of the finished piece, but it does look cool on a page protector too, especially if you want to use said protector as a memorabilia pocket in an album. Now, just add the fragment to your project and consider it done! Personally, I think they’re interesting and pretty enough to stand on their own, so I leave them alone. You can see that I ended up using different colours for my finished tag – now I just have to find a spot to put the teal one I made! As always, leave me a comment with a link to any projects you try using this technique – I’d love to see what you come up with! Can alcohol painting be done on wood? Technically,no. 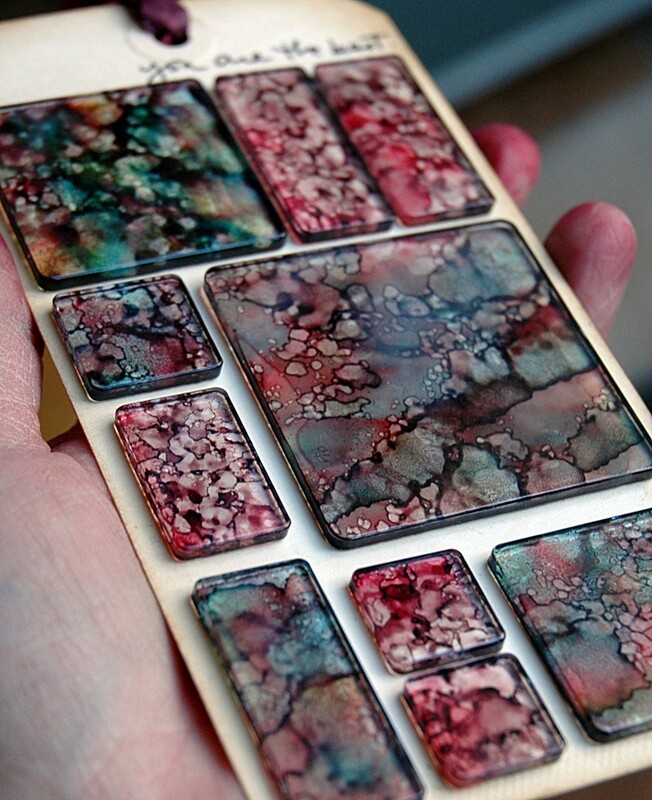 Alcohol Ink needs a smooth and nonporous surface to move and blend in the way it’s meant to. On wood it would simply soak right in and you wouldn’t get the flow of ink. on pinterest “alcohol ink on glass from old frames” is that you? if so, how do you round the edges/corners and/or, do you put them back in the frames once done or,how do you display them. 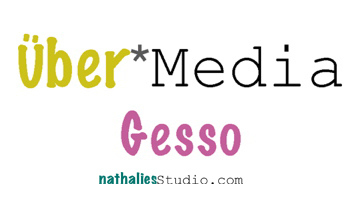 enjoyed your site so many lovely things to get my creative juices flowing – thank you. kindly reply via email – again, thanks. Hi Margrit! That isn’t my work on Pinterest however, I would place the glass back in the frame when I was done . I’m sure if you took it to a garage that deals in glass, they could round the edges as well! Do you view the fragment from the painted side or the underside? Two looks must be available. Depending on the look and use I’m going for, I’ve viewed the fragment from both sides. If it’s going to undergo heavy use, I’d recommend having the uninked side facing up so you don’t scratch off the design. 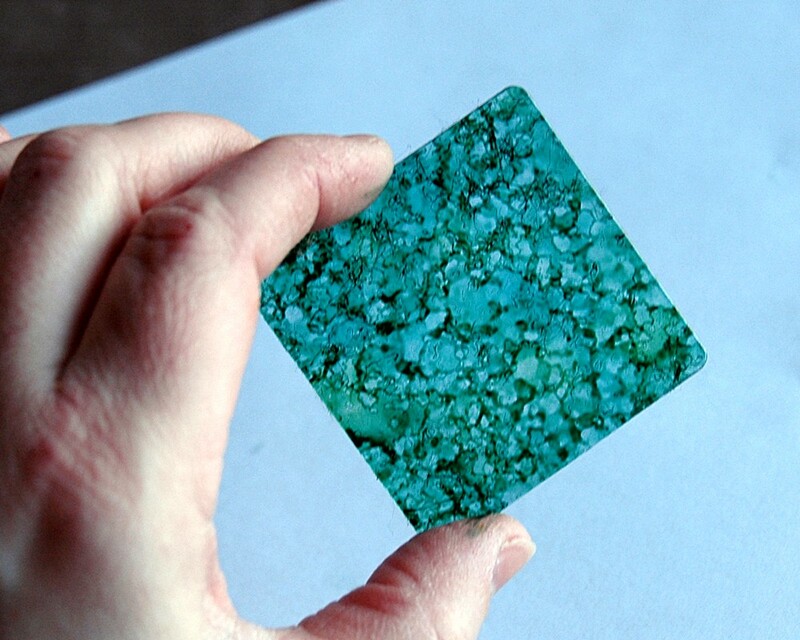 Have you tried this on plexiglass??? I’m going to try it on my upper panel’s in my breezeway for a stained glass look. Cindee, I haven’t tried them on plexiglass but since it’s a smooth, nonporous surface it should work perfectly. Please send a picture if you try it on your panels – I’d love to see the outcome! Alcohol inks are translucent so I’m sure it will look beautiful! Where do I get ftagments? Hi Jenny, you can order them through most retailers. 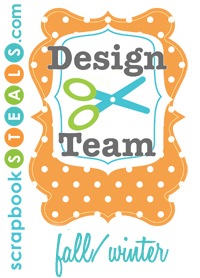 I know Simon Says Stamp carries them – just search Tim Holtz Idea-ology Fragments. 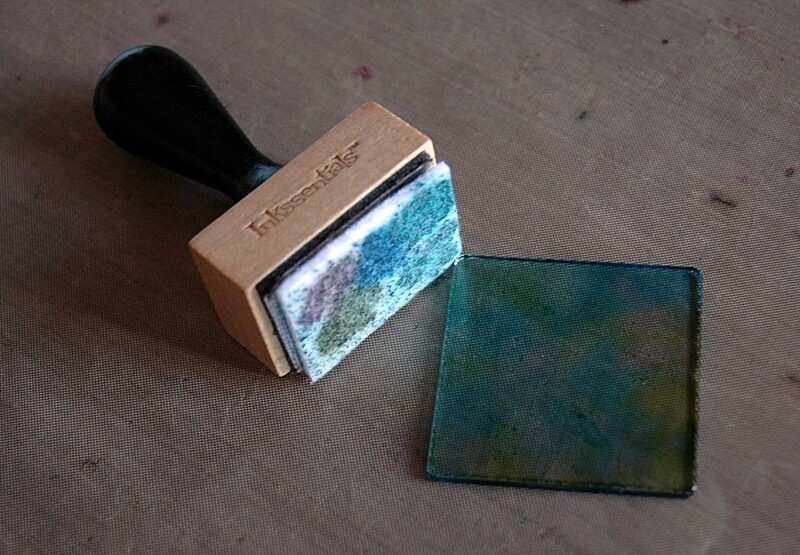 Where do you get the stamper with the felt? Hi Cindy! It’s a Ranger ink blending tool and it comes with foam but you can buy the felt refill pads separately. Most local scrapbook stores or online shops will carry them. I normally but through Simon Says Stamp. 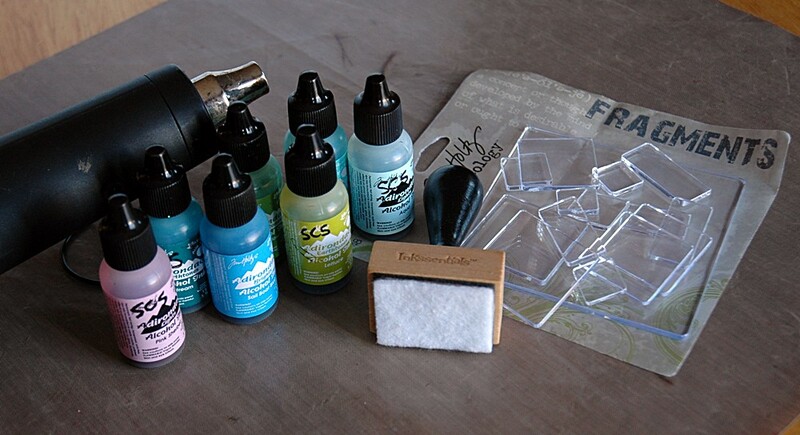 The tool is here: ://www.simonsaysstamp.com/product/Ranger-Inkssentials-INK-BLENDING-TOOL-Applicator-Foam-IBT23616 and the felt pads are here: ://www.simonsaysstamp.com/product/Tim-Holtz-Ranger-ALCOHOL-INK-APPLICATOR-REFILLS-Felt-TIM20844. How does the black areas show up???? Hi Trent. The black is actually where the inks have layered together as they’ve started to dry and been pounced around. Those overlapping areas make the “veins” in the marble! Hi! This technique is amazing!! I’m interested in using this technique on drawer knobs for my travel trailer kitchen cabinet remodel. The cabinets will be white and I really want to add a pop of color. In an earlier comment you mentioned that you haven’t done this on any high use surfaces. What do you think? Should I plan to research a top coat to keep the ink from wearing off? Hi Jeanne! I’d love to see your cabinets once they’re done – alcohol inks on the knobs would be amazing! They would definitely need to be sealed and Ranger recommends their Gloss Multi Medium (http://rangerink.com/?product=ranger-multi-medium). I can personally say that it’s a great product, dries clear and glossy with no yellowing. You could try a spray sealant as well but sometimes those don’t do as great a job on high use areas. Good luck! Do you seal them with anything so the ink doesn’t transfer off to skin or fabric? These are so cool looking. Thanks for sharing them! I have been doing this for a year or so, and love “playing” with alcohol ink! Mine look a lot like yours. If you have them online anywhere I’d love to see what you’ve done! It looks like it would be a nice bookmark too! Wow those little tags look amazing! 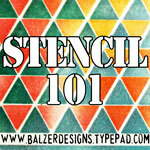 Great technique, thanks Sara for sharing this detailed how-to, I think I just might try it! Believe it or not I have yet to play with alcohol ink! Someday though cause it looks cool! These are completely different than Distress Inks – they’re a waterbased dye and these are alcohol based, to be used on slick surfaces. And these are the actual inks, they don’t come in a pad. Also, ink pads don’t need to be stored upside down, the pads are made to hold the dyes in suspension, kind of like a sponge holds water. So when you press a stamp onto the pad, the ink rises to the surface. Hope this helps, Heather!